LOUISVILLE – On the heels of the Big Tent conference in St. Louis, the ongoing PC(USA) Facing Racism campaign has released resources from the event with the theme “Race, Reconciliation and Reformation.” The conference emphasized the hope of the gospel and its power to transform society in our current cultural context marked by anxiety, racial division, political animosity and economic inequality. The call to action for this installment asks congregations, mid councils and Presbyterian-affiliated organizations to plan educational events using Big Tent resources including Eric D. Barreto’s Bible study, the Rev. Dr. J. Herbert Nelson, II’s sermon When Our Backs Are Against the Wall, and Christine Hong’s sermon on the Parable of the Sower. The study guide, titled “Shifting Accountability for Racial Ethnic Ministries in the PC(USA) from Variety to Equity,” is meant to help Presbyterians engage in conversations to end structural racism and move toward racial equity in the church and in our society. 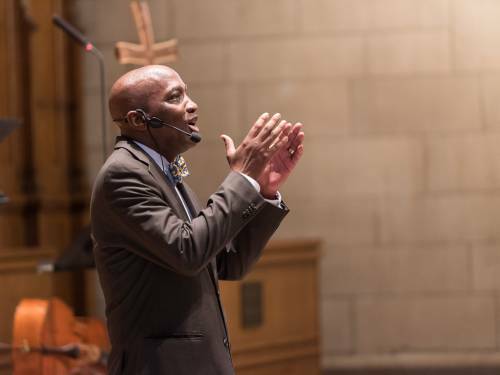 Acting on the directive of the 222nd General Assembly (2016) of the Presbyterian Church (U.S.A.), the communication agencies of the denomination’s six agencies are collaborating on the Facing Racism program to produce and promote antiracism resources for the church. “Because of our biblical understanding of who God is and what God intends for humanity, the PC(USA) must stand against, speak against, and work against racism. Antiracist effort is not optional for Christians. It is an essential aspect of Christian discipleship, without which we fail to proclaim the Good News of Jesus Christ.” (p. 2, Facing Racism: A Vision of the Intercultural Community, Churchwide Antiracism Policy). The electronic campaign sharing Facing Racism resources began March 21, 2017, and concludes in the spring prior to the 223rd General Assembly meeting in June 2018. The bimonthly emails highlight various antiracism resources available for use in congregations and mid councils, and include a call to action along with a schedule of upcoming events. The FacingRacism.org website serves as a starting point for the dissemination of resources and offers a link to subscribe to receive regular updates on newly available materials.